For other people with similar names, see Patrick O'Brien. 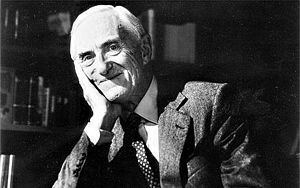 Patrick O'Brian, CBE (12 December 1914 – 2 January 2000), born Richard Patrick Russ, was an English novelist and translator, best known for his Aubrey–Maturin series of sea novels set in the Royal Navy during the Napoleonic Wars, and centred on the friendship of the English naval captain Jack Aubrey and the Irish–Catalan physician Stephen Maturin. The 20-novel series, the first of which is Master and Commander, is known for its well-researched and highly detailed portrayal of early 19th-century life, as well as its authentic and evocative language. A partially finished 21st novel in the series was published posthumously containing facing pages of handwriting and typescript. O'Brian wrote a number of other novels and short stories, most of which were published before he achieved success with the Aubrey–Maturin series. He also translated works from French to English, and wrote two biographies. His major success as a writer came late in life, when the Aubrey-Maturin series caught the eye of an American publisher. The series drew more readers and favourable reviews when the author was in his seventies. Near the end of his life, and in the same year he lost his beloved wife, British media revealed details of O'Brian's early life, first marriage, and post-war change of name, causing distress to the very private author and to many of his readers at that time. In 1934, he underwent a brief period of pilot training with the Royal Air Force, but this was not successful, and he left the RAF. Prior to that, his application to the Royal Navy had been rejected on health grounds. In 1935, he was living in London, where he married his first wife, Elizabeth Jones, in 1936. They had two children. The second was a daughter who suffered from spina bifida; she died in 1942, aged three, in a country village in Sussex. When the child died, O'Brian had already returned to London, where he worked throughout the war. The details of his work during the Second World War are murky. He worked as an ambulance driver, and he stated that he worked in intelligence (Political Intelligence Department (PID). Dean King has claimed that O'Brian was actively involved in intelligence work and perhaps special operations overseas during the war. :89–104 Indeed, despite his usual extreme reticence about his past, O'Brian wrote in an essay, "Black, Choleric and Married? ", included in the book Patrick O'Brian: Critical Appreciations and a Bibliography (1994) that: "Some time after the blitz had died away I joined one of those intelligence organisations that flourished during the War, perpetually changing their initials and competing with one another. Our work had to do with France, and more than that I shall not say, since disclosing methods and stratagems that have deceived the enemy once and that may deceive him again seems to me foolish. After the war we retired to Wales (I say we because my wife and I had driven ambulances and served in intelligence together) where we lived for a while in a high Welsh-speaking valley..." which confirms in first person the intelligence connection, as well as introducing his wife Mary Wicksteed Tolstoy as a co-worker and fellow intelligence operative. Nikolai Tolstoy, stepson through O'Brian's marriage to Mary Tolstoy, disputes this account, confirming only that O'Brian worked as a volunteer ambulance driver during the Blitz. Doing this work, he met Mary, the separated wife of Russian-born nobleman and lawyer Count Dimitri Tolstoy. They lived together through the latter part of the war and, after both were divorced from their previous spouses, they married in July 1945. The following month he changed his name by deed poll to Patrick O'Brian. The disease that racked my bosom every now and then did not much affect my strength and when it left me in peace (for there were long remissions) sea-air and sea-voyages were recommended. An uncle had a two-ton sloop and several friends had boats, which was fine, but what was even better was that my particular friend Edward, who shared a tutor with me, had a cousin who possessed an ocean-going yacht, a converted square-rigged merchantman, that he used to crew with undergraduates and fair-sized boys, together with some real seamen, and sail far off into the Atlantic. The young are wonderfully resilient, and although I never became much of a topman, after a while I could hand, reef and steer without disgrace, which allowed more ambitious sailoring later on. However, in 1995, venture capitalist Thomas Perkins offered O'Brian a two-week cruise aboard his then sailing yacht, a 154 ft ketch. In an article about the experience written after O'Brian's death, Perkins commented that "... his knowledge of the practical aspects of sailing seemed, amazingly, almost nil" and "...he seemed to have no feeling for the wind and the course, and frequently I had to intervene to prevent a full standing gybe. I began to suspect that his autobiographical references to his months at sea as a youth were fanciful." Between 1946 and 1949 the O'Brians lived in Cwm Croesor, a remote valley in north Wales, where they initially rented a cottage from Clough Williams-Ellis. O'Brian pursued his interest in natural history; he fished, went birdwatching, and followed the local hunt. During this time they lived on Mary O'Brian's small income and the limited earnings from O'Brian's writings. In 1949 O'Brian and Mary moved to Collioure, a Catalan town in southern France. He and Mary remained together in Collioure until her death in 1998. Mary's love and support were critical to O'Brian throughout his career. She worked with him in the British Library in the 1940s as he collected source material for his anthology A Book of Voyages, which became the first book to bear his new name — the book was among his favourites, because of this close collaboration. The death of his wife in March 1998 was a tremendous blow to O'Brian. In the last two years of his life, particularly once the details of his early life were revealed to the world, he was a "lonely, tortured, and at the last possibly paranoid figure." He continued to work on his naval novels until his death in early 2000. He spent the winter of 1998–1999 at Trinity College, Dublin and died there on 2 January 2000. O'Brian protected his privacy fiercely and was usually reluctant to reveal any details about his private life or past, preferring to include no biographical details on his book jackets and supplying only a minimum of personal information when pressed to do so. For many years reviewers and journalists presumed he was Irish, and he took no steps to correct the impression. One interviewer described the man in his late seventies as "a compact, austere gentleman. ... his pale, watchful eyes are clear and alert." He is polite, formal, and erudite in conversation, an erudition that Horowitz said could be intimidating. He learned from those who worked with O'Brian that the erudition did not go unnoticed, while they remained friends. "Richard Ollard, a naval historian, calls this particular habit "blowing people out of the game." Ollard, who edited the early Aubrey/Maturin Novels, urged O'Brian to tone down the most obscure allusions, though the books remain crammed with Latin tags, antiquated medical terminology and an endless stream of marvellous sounding but impenetrable naval jargon. "Like many who have struggled themselves," Ollard said of his friend, "he thought others should struggle, too." One longtime acquaintance put it more bluntly: "Patrick can be a bit of a snob, socially and intellectually."" In 1998, a BBC documentary and an exposé in The Daily Telegraph made public the facts of his ancestry, original name and first marriage, provoking considerable critical media comment. In his biography of O'Brian, Nikolai Tolstoy claims to give a more accurate and balanced account of his late stepfather's character, actions and motives, particularly in respect of his first marriage and family. Lanchester, in reviewing Tolstoy's book, says "The last few years have been disheartening for Patrick O'Brian's many fans." He does not find the arguments altogether persuasive, and with access to documents that Dean King never saw, Tolstoy "gives a portrait of a man who is cold, bullying, isolated, snobbish and super-sensitive." Lanchester closes by saying "Let's agree, we O'Brianists, to read the novels and forget everything else." Veale, in reviewing King's book, says that "however judicious and well-grounded his [King's] speculation, he fails to crack his subject's protective shell. In the end, Aubrey and Maturin will have to thrive on their own -- which is how the willfully enigmatic O'Brian most likely intended it." As if anticipating 21st-century debates and disappointments once O'Brian's past was exposed, Horowitz interviewed O'Brian at his home in France in 1994: "Until recently, he refused all interviews. Those authors we know the least about, he says, are the ones we get in their purest form, like Homer. In The Truelove, Stephen warns would-be interviewers that "question and answer is not a civilized form of conversation." O'Brian deflects direct inquiries about his private life, and when asked why he moved to the south of France after World War II, he stops and fixes his interrogator with a cold stare. "That seems to be getting rather close to a personal question," he says softly, walking on." At his death, many obituaries were published evaluating his work, particularly in the Aubrey-Maturin series, and the too-recent revelations of his biography prior to his marriage to Mary Wicksteed Tolstoy. Playwright David Mamet wrote an appreciation. His American publisher, W. W. Norton, wrote an appreciation, mentioning their story with O'Brian, how pleased they were the three times he came to the US, in 1993, 1995 and in November 1999 only weeks before his death, and noting sales in the US alone of over three million copies. O'Brian died on 2 January 2000 at Trinity College in Dublin, where he had been living and working on his next book. His body was returned to Collioure, where he is buried next to his wife. O'Brian published two novels, a collection of stories and several uncollected stories under his original name, Richard Patrick Russ. His first novel, Caesar: The Life Story of a Panda-Leopard, was written at the age of 12 and published three years later in 1930. It was a critical success, with a recommendation in the New Statesman and positive reviews in publications including the New York Herald Tribune and the Saturday Review of Literature. :50 Other stories followed, published in boys' magazines and annuals and incorporating themes of natural history and adventure, and a collection of these and other animal stories was published in 1934 under the title Beasts Royal, with illustrations by the noted artist Charles Tunnicliffe, illustrator of Tarka the Otter. Hussein: An entertainment, set in India, was published in 1938, when he was 23. It was notable for being the first book of contemporary fiction ever published by the Oxford University Press,:75 to whose annuals for boys he had been a regular contributor for some years. O'Brian published very little under his original name of Russ during World War II, and nothing after 1940. His change of surname in 1945 necessarily meant abandoning the literary reputation he had built up as R. P. Russ. O'Brian returned to writing after the war, when he moved to rural Wales. His non-fiction anthology A Book of Voyages (1947) attracted little attention. A collection of short stories, The Last Pool, was published in 1950 and was more widely and favourably reviewed, although sales were low. :151–151 The countryside and people around his village in Wales provided inspiration for many of his short stories of the period, and also his novel Testimonies (1952), which is set in a thinly disguised Cwm Croesor, and which was well received by Delmore Schwartz in Partisan Review in 1952. His next novel was The Catalans, published in 1953. The review in the New York Times noted O'Brian's accomplishments in Testimonies; The Catalans was viewed as a series of well-written scenes by an observant author, but the reviewer did not think it held together as a novel. Over four decades he worked on his own writings, his British literary reputation growing slowly. He became an established translator of French works into English. His early novels and several of the translations were published by Rupert Hart-Davis from 1953 to 1974. O'Brian wrote the first of the Aubrey-Maturin series in 1969 at the suggestion of American publisher J.B. Lippincott, following the death of C S Forester in 1966, a writer of popular nautical novels. The Aubrey-Maturin books were quietly popular in Britain; after the first four volumes they were not published in the United States. In the early 1990s the series was successfully relaunched into the American market by the interest of Starling Lawrence of W W Norton publishers, attracting critical acclaim and dramatically increasing O'Brian's sales and public profile in the UK and America. :Ch.22–23 Paul D Colford notes that when O'Brian "visited the United States a few weeks ago, fans waiting to meet, lunch and have tea with him included Walter Cronkite, Sen. Dirk Kempthorne (R-Idaho) and Supreme Court Justice Anthony Kennedy, who invited O'Brian to attend a session of the high court. Hollywood also wants a piece of the press-shy storyteller." The novels sold over 3 million copies in 20 languages. In its review of 21 (published in 2004), Publishers Weekly says that over 6 million copies have been sold. Thus O'Brian's greatest success in writing, gaining him fame, a following and invitations to events and interviews came late in his life, when he was well into his seventies, and accustomed to his private life. Shortly before his last completed novel was published in October 1999, O'Brian wrote an article for a series of the best in the millennium ending, titled Full Nelson, choosing for his topic Admiral Nelson's victory in the Battle of the Nile in 1798. Beginning in 1969, O'Brian began writing what turned into the 20-volume Aubrey–Maturin series of novels. The books are set in the early 19th century and describe the life and careers of Captain Jack Aubrey and his friend, naval physician Dr Stephen Maturin. The books are distinguished by O'Brian's deliberate use and adaptation of actual historical events, either integrating his protagonists in the action without changing the outcome, or using adapted historical events as templates. In addition to this trait and to O'Brian's distinctive literary style, his sense of humour is prominent (see Humour in main article, Aubrey-Maturin series). Technical sailing terminology is employed throughout the series. The books are considered by some critics to be a roman fleuve, which can be read as one long story; the books follow Aubrey and Maturin's professional and domestic lives continuously. As well as his historical novels, O'Brian wrote three adult mainstream novels, six story collections, and a history of the Royal Navy aimed at young readers. He was also a respected translator, responsible for more than 30 translations from the French, including Henri Charrière's Papillon into English, Jean Lacouture's biography of Charles de Gaulle, as well as many of Simone de Beauvoir's later works. O'Brian wrote detailed biographies of Sir Joseph Banks, an English naturalist who took part in Cook's first voyage (and who appears briefly in O'Brian's Aubrey-Maturin series), and Pablo Picasso. His biography of Picasso is a massive and comprehensive study of the artist. Picasso lived for a time in Collioure, the same French village as O'Brian, and the two became acquainted there. Peter Weir's 2003 film, Master and Commander: The Far Side of the World is loosely based on the novel The Far Side of the World from the Aubrey–Maturin series for its plot, but draws on a number of the novels for incidents within the film. The character of Jack Aubrey is drawn from the character in the novels. In 1995 he was awarded the inaugural Heywood Hill Literary Prize for his lifetime's writings. In his acceptance speech in July 1995, O'Brian, then age 80, said it was the first literary prize of his adult life, in the amount of 10,000 pounds. He received a CBE in 1997. Trinity College Dublin awarded him an honorary doctorate in 1997. O'Brian claimed that he wrote "like a Christian, with ink and quill"; Mary was his first reader and typed his manuscripts "pretty" for the publisher. O'Brian wrote all of his books and stories by hand, shunning both typewriter and word processor. The handwritten manuscripts for 18 of the Aubrey-Maturin novels have been acquired by the Lilly Library at Indiana University. Only two - The Letter of Marque and Blue at the Mizzen - remain in private hands; the private hands are those of Stuart Bennet. Bennet donated his correspondence from O'Brian to the Lilly Library; one of the letters recommends to Bennet that he donate the two manuscripts he holds to Indiana University, where the rest of the manuscripts reside. The O'Brian manuscript collection at the Lilly Library also includes the manuscripts for Picasso and Joseph Banks and detailed notes for six of the Aubrey/Maturin novels. The 2011 exhibit titled Blue at the Mizzen suggests that the manuscript was donated. Nikolai Tolstoy also possesses an extensive collection of O'Brian manuscript material, including the second half of Hussein, several short stories, much of the reportedly "lost" book on Bestiaries, letters, diaries, journals, notes, poems, book reviews, and several unpublished short stories (Tolstoy, various pages). Since his death, there have been two biographies published, though the first was well advanced when he died. The second is the first volume of a planned two-volume biography by O'Brian's stepson. Dean H King's life of O'Brian, Patrick O'Brian: A Life Revealed was the first biography to document O'Brian's early life under his original name. In November 2004, Nikolai Tolstoy published Patrick O'Brian: The Making of the Novelist, the first volume in a two-part biography of O'Brian using material from the Russ and Tolstoy families and sources, including O'Brian's personal papers and library, which Tolstoy inherited on O'Brian's death. C S Forester, (1899-1966), author of the Horatio Hornblower novels. ^ a b Brown, Anthony Gary (2014) . The Patrick O'Brian Muster Book: Persons, Animals, Ships and Cannon in the Aubrey-Maturin Sea Novels (Second ed.). Jefferson, North Carolina: McFarland & Company. ISBN 978-0-7864-2482-5. ^ a b c d e f g h King, Dean (2000). Patrick O'Brian:A life revealed. London: Hodder & Stoughton. ISBN 0-340-79255-8. ^ a b c d e Veale, Scott (5 March 2000). "The Man Without a Past". Review. The New York Times. Retrieved 4 June 2015. ^ O'Brian, Patrick (17 April 2001) . Caesar: The Life Story of a Panda Leopard. W. W. Norton. ISBN 978-0393321821. ^ "Patrick O'Brian". The Telegraph. 7 January 2000. Retrieved 19 February 2019. ^ a b Cunningham, A.E., ed. (1994). Patrick O'Brian: Critical Appreciations and a Bibliography. London: The British Library Publishing Division. pp. 15–19. ISBN 0-7123-1070-3. ^ Tolstoy, Nikolai (2005). Patrick O'Brian: The making of the novelist. Arrow. pp. 269–274. ISBN 978-0393061307. ^ Perkins, Tom (August 2000). "Cruising with Patrick O'Brian - The Man and the Myth". Latitude 38. Retrieved 30 March 2017. ^ a b c Tolstoy, Nikolai (2004). Patrick O'Brian: The making of the novelist. London: Random House. ISBN 0-09-941584-4. ^ a b c d e Horowitz, Mark (16 May 1993). "Patrick O'Brian's Ship Comes In". Books. The New York Times. Retrieved 4 June 2015. ^ Fenton, Ben (24 October 1999). "The Secret Life of Patrick O'Brian". The Daily Telegraph. Archived from the original on 5 January 2006. Retrieved 26 August 2008. ^ a b Lanchester, John (9 November 2004). "Remember him as a writer". The Telegraph. Retrieved 4 June 2015. ^ Williams, Ian (13 January 2000). "Patrick O'Brian: The author of the wildly popular 18th century seagoing saga created, out of his own life, a fiction nearly as elaborate". Salon. Retrieved 8 June 2015. ^ Romano, Carlin (8 January 2000). "Novelist Patrick O'brian, Writer Of Naval Series, Dies". The Philadelphia Inquirer. Retrieved 8 June 2015. ^ Balzar, John (8 January 2000). "Patrick O'Brian; British Master of the High-Seas Adventure Novel". Los Angeles Times. Retrieved 8 June 2015. ^ a b Holland, Kitty (7 January 2000). "Author Patrick O'Brian Dies in Dublin". The Irish Times. Retrieved 8 June 2015. ^ Webb, W L (8 January 2000). "Patrick O'Brian". The Guardian. Retrieved 8 June 2015. ^ Mamet, David (17 January 2000). "The Humble Genre Novel, Sometimes Full of Genius". The New York Times. Retrieved 8 June 2015. His Aubrey-Maturin series, 20 novels of the Royal Navy in the Napoleonic Wars, is a masterpiece. It will outlive most of today's putative literary gems as Sherlock Holmes has outlived Bulwer-Lytton, as Mark Twain has outlived Charles Reade. God bless the straightforward writer, and God bless those with the ability to amuse, provoke, surprise, shock, appall. ^ "Patrick O'Brian". W W Norton. 2003. Retrieved 8 June 2015. ^ "Patrick and Mary O'Brian's grave in Collioure". Retrieved 26 August 2008. ^ King, Dean (2000). Patrick O'Brian: a life revealed (1st ed.). New York: H Holt. pp. 192–200. ISBN 0805059768. OCLC 42437180. ^ Bosman, Julie (30 June 2011). "Lawrence Steps Down as Norton's Editor In Chief". The New York Times. Retrieved 4 June 2015. ^ Colford, Paul D (6 January 1994). "The Tide Is Changing for an Obscure Novelist". Los Angeles Times. Retrieved 16 March 2015. ^ "21: The Final Unfinished Voyage of Jack Aubrey". Editorial Reviews. Publishers Weekly. October 2004. Retrieved 31 March 2015. ^ O'Brian, Patrick (1999). "BEST NAVAL BATTLE – Full Nelson: Outmanned and outgunned, the British flummoxed the French". Best in 1,000 Years. The New York Times Magazine. Retrieved 8 June 2015. It was a famous victory: it shattered Bonaparte's scheme in Egypt and India; it had great political influence in Europe; it was splendidly rewarded, with medals, promotions and quantities of presents bestowed on those who fought, and it awakened the world to Lord Nelson's glory. ^ King, Dean (2001). Patrick O'Brian: A Life. New York: Henry Holt and Co. p. 355. ^ "Letters, 1985-1996. O'Brian, Patrick, 1914-2000". Archive Grid. Indiana University. Retrieved 4 June 2015. ^ "Letters, 1985-1996". WorldCat. Retrieved 4 June 2015. ^ "Blue at the Mizzen: Patrick O'Brian and the 19th century: an exhibition". The Lilly Library. Indiana University. 14 September 2011. Retrieved 4 June 2015. ^ "Creative Writing Program: Additional Opportunities". Lilly Library holdings. Indiana University. Archived from the original on 24 October 2007. Retrieved 4 June 2015. Dean H. King (2000). Patrick O'Brian – A life revealed. Hodder & Stoughton Ltd. ISBN 0-340-79256-6. Nikolai Tolstoy (2004). Patrick O'Brian: The Making of the Novelist. Century. ISBN 0-7126-7025-4. A. E. Cunningham, ed. (1994). Patrick O'Brian: Critical appreciations and a bibliography. British Library. ISBN 0-7123-1071-1. Richard O'Neill (2003). Patrick O'Brian's Navy, The Illustrated Companion to Jack Aubrey's World. Salamander Books. ISBN 0-7624-1540-1. Wikimedia Commons has media related to Patrick O'Brian. Patrick O'Brian Home Page – introduction to the author and his books, by his US publisher. Stephen Becker. "Patrick O'Brian, The Art of Fiction No. 142". The Paris Review. WikiPOBia – wiki to annotate the written works of Patrick O'Brian. Patrick O'Brian Mapping Project – A Google Maps mashup project to map all 21 books in the Aubrey–Maturin series.